Pastor Chuck Baldwin, who hosts the radio show Chuck Baldwin Live and writes a syndicated column, appeared on Sheila Zilinsky’s podcast to discuss guns. “Therefore, you must have the means of self-defense,” he said. Could a Christian get away with just taking a self-defense class? Or maybe just buying a handgun? 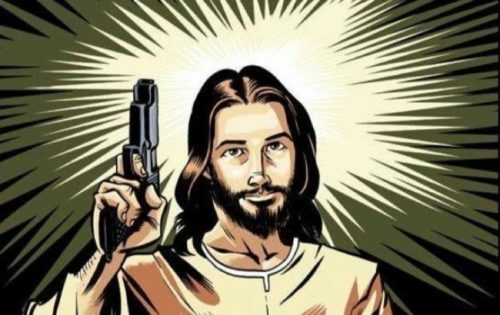 No, says the pastor; you need a weapon that can kill as many people as possible, as fast as possible… something that’s a favorite of mass shooters. Baldwin didn’t describe what hellish place he lives in where an semi-automatic rifle is necessary for self-defense, where hordes of people are attacking him so often that he needs an AR-15 to legitimately defend himself. “That is a biblical requirement,” he said.